Purpose To report a case of possible trypan blue retinotoxicity after macular hole surgery. Methods Retrospective review of case notes and follow-up in one patient with unusual appearance of the fundus after macular hole surgery with trypan blue. Results A 69-year-old female presented to our eye clinic with a complaint of loss of vision over the last 6 months. Examination showed a full-thickness macular hole in the right eye. She underwent right pars plana vitrectomy with internal limiting peel assisted by trypan blue. Surgery was routine with no difficulty during surgical peel of the inner limiting membrane. Two weeks postoperatively, increased pigmentation and atrophy at the level of the retinal pigment epithelium (RPE) was noted temporal to the fovea. The macular hole appeared closed. Fundus fluorescein angiography showed this to be a lesion with characteristics of RPE atrophy. 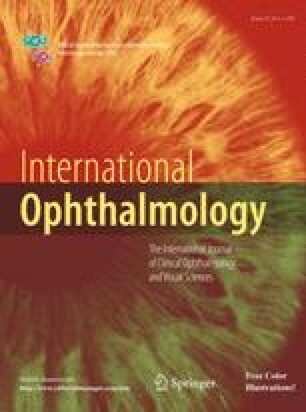 Conclusion In the absence of excessive peroperative surgical trauma to the region of the scar, the retinal changes may be secondary to possible toxicity due to trypan blue stain, light toxicity or a combination of both. The authors wish to thank Bill Hooley, Ophthalmic photographer, St. Paul’s Eye Unit, Royal Liverpool University Hospital, Liverpool.